GOP senators say the Judiciary Committee will vote Friday morning on Brett Kavanaugh's nomination to the Supreme Court. Their announcement comes after Kavanaugh finished his testimony to the Senate Judiciary Committee after allegations of sexual assault by Dr. Christine Blasey Ford. In his opening remarks, Kavanaugh told the panel that he “will not be intimidated” into withdrawing his nomination. In the morning, Ford testified that she is "100 percent" certain Kavanaugh is the one who assaulted her at a party in Montgomery County in the 1980s. UDPATE: GOP senators say the Judiciary Committee will vote Friday morning on Brett Kavanaugh’s nomination to the Supreme Court. WASHINGTON – Supreme Court nominee Judge Brett Kavanaugh and Professor Christine Blasey Ford testified before the Senate Judiciary Committee Thursday. The focus was on Ford’s allegations that Kavanaugh sexually assaulted her when they were teens. Watch the full testimony of both Ford and Kavanaugh below. Senate Republicans are huddling to discuss the next steps on Brett Kavanaugh’s nomination to the Supreme Court. Supreme Court nominee Brett Kavanaugh says he didn’t watch Christine Blasey Ford testify about her accusation that he sexually assaulted her when they were teens. Kavanaugh defiantly denied allegations he sexually assaulted Christine Blasey (BLAH’-zee) Ford when they were high school students. Ford testified earlier in the day that she was “100 percent” certain Kavanaugh assaulted her. President Donald Trump is encouraged by Supreme Court nominee Brett Kavanaugh’s passionate denials of Christine Blasey (BLAH’-zee) Ford’s claims that he sexually assaulted her in high school. 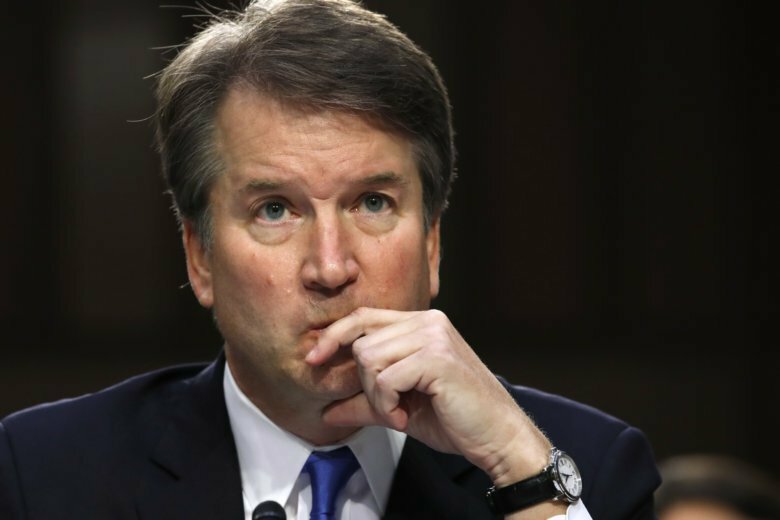 Supreme Court nominee Brett Kavanaugh has apologized after tangling with Democratic Sen. Amy Klobuchar (KLOH’-buh-shar) over his drinking in high school. The senator from Minnesota asked Kavanaugh on Thursday about his drinking habits during a hearing on sexual assault allegations. Christine Blasey (BLAH’-zee) Ford says Kavanaugh was drunk at the time he sexually assaulted her. Republican Sen. Lindsey Graham says the Democrats’ treatment of Supreme Court nominee Brett Kavanaugh is the “most despicable thing” he has seen in politics. Supreme Court nominee Brett Kavanaugh is apologizing to a high school acquaintance whose name was in a yearbook entry written by him and others with the word “alumnus” after. Supreme Court nominee Brett Kavanaugh says Democrats’ actions in the past couple of weeks may mean he will never again get to do two things he loves, teach law and coach basketball. The judge sounded angry and tried to hold back tears Thursday as he told senators he was “innocent of this charge.” Christine Blasey (BLAH’-zee) Ford testified earlier that he groped her and held her down during a party when they were teens. Melania Trump has not been watching the Senate Judiciary Committee hearing featuring Supreme Court nominee Brett Kavanaugh and Christine Blasey (BLAH’-zee) Ford. Kavanaugh denies Ford’s allegation. He has also denied claims of sexual misconduct against him a few other women. Supreme Court nominee Brett Kavanaugh says he “never had any sexual or physical encounter of any kind” with Christine Blasey Ford. She says he and a friend barricaded her in a room and Kavanaugh got on top of her and covered her mouth so she could not cry out for help. She says she is “100 percent” certain it was Kavanaugh who attacked her. Supreme Court nominee Brett Kavanaugh is telling a Senate panel that he “will not be intimidated” into withdrawing his nomination to the Supreme Court. She says the attack is seared in her memory and she is “100 percent” certain that it was Kavanaugh who attacked her. Republican Sen. Lindsey Graham says he’s now more convinced than ever that Democrats’ goal is to delay the vote on President Donald Trump’s Supreme Court nominee to after the midterms. Graham spoke Thursday afternoon after Christine Blasey Ford finished testifying at a hearing by the Senate Judiciary Committee on Brett Kavanaugh’s nomination. She says he sexually assaulted her when they were teenagers, which Kavanaugh denies. Graham called Ford “a nice lady who has come forward to tell a hard story,” but he called her account “uncorroborated.” He complained that she couldn’t remember the house, the city or the month in which she says the attack occurred. The New York senator said Thursday that it is “an outrage” that Republicans did not force Kavanaugh’s friend Mark Judge to testify under oath. Ford says Judge was present when Kavanaugh attacked her. She said Thursday that she was “terrified” to be speaking at the hearing but felt that it was her civic duty to come forward. Kavanaugh is set to testify next. He has denied Ford’s allegation. The memoir of Brett Kavanaugh’s friend Mark Judge appears to support one aspect of Christine Blasey Ford’s account of the summer of 1982. Two attorneys representing Christine Blasey (BLAH’-zee) Ford at her Senate Judiciary Committee hearing say they’re working for her pro bono. California psychology professor Christine Blasey (BLAH’-zee) Ford finished her testimony Thursday afternoon, about four hours after the hearing began. Ford alleges that one night in the summer of 1982, a drunken Kavanaugh forced her down on a bed, groped her and tried to take off her clothes. She said she was ultimately able to escape. Christine Blasey (BLAH’-zee) Ford says she doesn’t have any political motivation for coming forward with accusations of sexual assault against Supreme Court nominee Brett Kavanaugh when they were teenagers. Two Republicans on the Senate Judiciary Committee say allegations made by Christine Blasey (BLAH’-zee) Ford against Supreme Court nominee Brett Kavanaugh haven’t been substantiated. For South Carolina Sen. Lindsey Graham, “It’s not about, `Do I believe her?”’ but whether the sexual assault allegation from when Ford and Kavanaugh were teenagers is corroborated. Some of the more talkative members of the Senate Judiciary Committee are suddenly quiet after hearing Christine Blasey (BLAH’-zee) Ford testify. Senate Majority Leader Mitch McConnell _ who’s not on the committee _ is ignoring reporters’ questions about how the hearing has been going. Miranda Greear of Roanoke, Va., is among the hundreds of people who have gathered on Capitol Hill to make their voices heard during Thursday’s historic Supreme Court confirmation hearing. Many of the protesters are wearing black tape over their mouths with the message “believe survivors” or have similar messages written on their upraised palms. Senate Judiciary Chairman Chuck Grassley has gaveled into session Thursday’s dramatic hearing with Christine Blasey Ford and Supreme Court nominee Brett Kavanaugh. Ford, in prepared remarks submitted to the committee, alleges that Kavanaugh groped her and tried to take off her clothes when they were teens. Kavanaugh, in his prepared testimony, says he’s never done anything “remotely resembling” what Ford describes. Grassley and the panel’s top Democrat, Sen. Dianne Feinstein, will deliver opening statements at the start of the hearing. Then Ford will be sworn in as a witness and deliver her opening statement. Kavanaugh will testify later, after her session is over. Organizers behind the Women’s March plan a “direct action” Thursday morning in the Hart Senate Office Building in support of Christine Blasey Ford, who will testify that Supreme Court nominee Brett Kavanaugh assaulted her during a drunken high school party. Elsewhere, a coalition of conservative women’s groups is planning an “I stand with Brett” rally near the Russell Senate Office Building. Kavanaugh’s confirmation hearing earlier this month was marred by dozens of protesters interrupting the hearing even before Ford’s allegation became public.